Detective Comics #978 Review – AiPT! Batman and Tim Drake don’t know what’s coming. 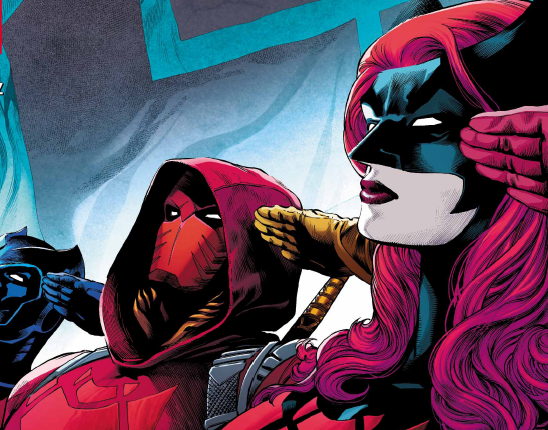 As James Tynion IV closes out his run on Detective Comics, readers are left wondering what will happen with Batman’s grand plan, Batwoman, and the possible future where a police state rules. There’s a lot hanging in the balance and it’s clear Tynion wants to close some doors on things he created in this series. That’s not only exciting, but scary if you’ve adored this series so far. “BATMAN ETERNAL” part three! Congratulations, Batwoman–you have an entire army at your command. So how are you going to use it? The most exciting thing about this arc is how Tynion will somehow reverse the terrible future. It has to happen, but how can Batman make the right decisions now to avoid being murdered and Gotham entering its worst possible future? That’s an exciting element even if it’s got some time travel logistical problems. Javier Fernandez blew me away with his work on this issue. From the very start Fernandez casts Batman in the perfect shadow while rendering Robin in a weakened and sorry state. You get the impression Batman is pissed and wants a resolution and Tim Drake may not be much help. It sets in motion the issue perfectly and is followed up with a wicked double page layout that has 17 panels atop a double page layout. Gorgeous work. The style is slightly gritty which suits the gloom and doom the story carries and there’s even a bit of the macabre thrown in, giving the book a Batman feel. Tynion shifts the story in an unexpected way which keeps it feeling fresh. I sort of expected it to go this route, but not this soon. It’s good because your classic “hero fighting hero” story is overdone too much. It’s also interesting to note how Batwoman’s tactics may be wrong on some level, but Batman clearly respects her enough to let her keep doing what she’s doing. This issue also cuts between Tim, the villain, and Batman quite well, keeping the pace moving and the story always developing. Another reason why this issue works so well is because Batman is at the forefront. The team is disbanded and scattered, but Batman is trying to make things right. He’s trying to protect Tim, do right to Batwoman, and not let anyone down. You get the sense he’s a father figure to them all and while he isn’t perfect he’s trying his best. It’s definitely not the easiest story to drop into so do yourself a favor and at least read the last few if not the entire run! The art will speak to you in its gloomy and gritty way while Tynion continues to keep you at the edge of your seat. This is about as good as Batman comics get. A great chapter with fantastic art and some unexpected developments. New readers will be very lost.